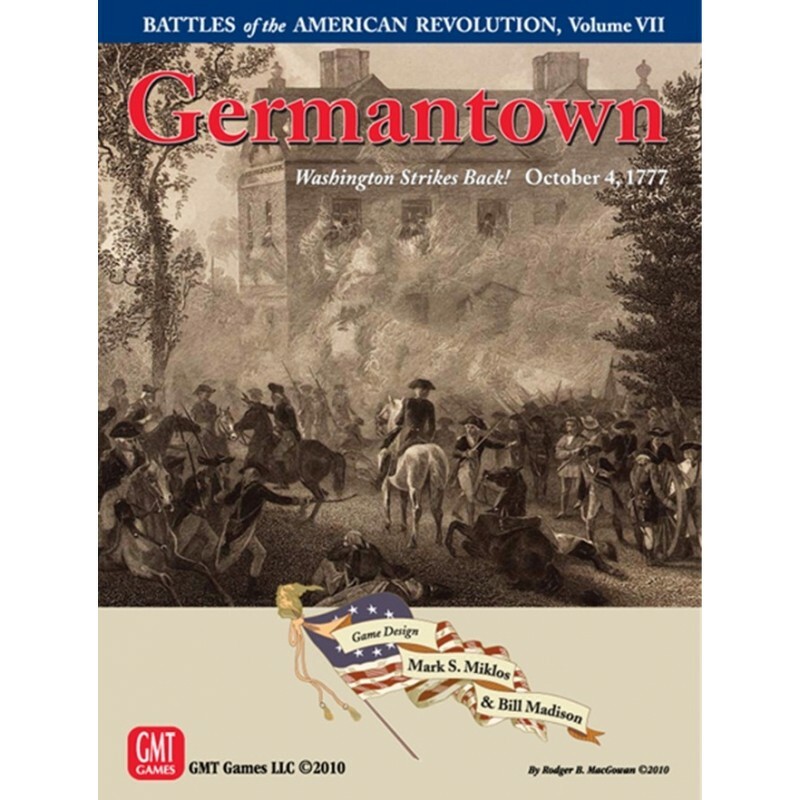 GMT is pleased to offer the latest in Mark Miklos' popular and critically acclaimed American Revolutionary War series: Volume VII, Germantown, 1777. Following their victory at Brandywine on September 11, 1777, British forces under Major General William Howe captured the colonial capital of Philadelphia. Unable to prevent this, General George Washington moved the 11,000-man Continental Army to a position approximately 30 miles northwest of the city. Howe was concerned about the proximity of the Americans. In response he left a garrison of 3,000 men in the city but moved with 9,000 men to Germantown, five miles from Philadelphia, in a position to block an American approach. Alerted to Howe's movement, Washington saw an opportunity to strike a blow against the British while he had numerical superiority. He developed a complicated attack plan which called for four converging columns to hit the British simultaneously before dawn. If the assault proceeded as planned the Americans would achieve a double envelopment that could prove decisive. The Americans moved out on the evening of October 3. Washington led the main force straight down the Germantown Road while Major General Nathanael Greene led a strong column against the British right. These attacks were to be supported by columns of militia which were to strike the British flanks. All of the American forces were to be in position “precisely at 5 o’clock with charged bayonets and without firing.” As at Trenton the previous December it was Washington's goal to take the British by surprise. Communications quickly broke down between the far-flung American columns. Washington's men in the center arrived as scheduled but Greene's men and the two columns of militia had become lost in the darkness and heavy morning fog. Believing that Greene was in position, however, Washington ordered the attack to commence. With Major General John Sullivan's division in the lead, Washington moved to engage British pickets in the hamlet of Mount Airy. Sullivan's men forced the British light infantry to retreat back towards Germantown. The British 40th Foot was bivouacked in a forward position around “Cliveden,” the estate of Benjamin Chew. Its commander, Colonel Thomas Musgrave, took six companies of his regiment, fortified the Chew House, and prepared to make a stand as the rest of his regiment and the light infantry fell back. The house was made of stone and acted like a natural fortification in the path of Washington’s advance. Sullivan's division and that of Brigadier General Anthony Wayne bypassed Cliveden and pushed on through the fog towards Germantown. Around this time the militia column assigned to attack the British left arrived and briefly engaged von Knyphausen's men before withdrawing. When he reached Cliveden with his staff Washington became convinced by his chief of artillery, Brigadier General Henry Knox that such a strongpoint could not be left in their rear. Brigadier General William Maxwell's reserve brigade was therefore brought forward to storm the house. Supported by Knox's artillery, Maxwell's men made several futile assaults against Musgrave's position taking heavy casualties in the process. Meanwhile, at the front, Sullivan and Wayne were exerting heavy pressure on the British center when Greene's men finally arrived on the field. After pushing British pickets out of hasty fieldworks thrown up at Luken's Mill, Greene advanced with Major General Adam Stephen's division on the right, his own division in the center, and Brigadier General Alexander McDougall's brigade on the left. Greene's men began to roll up the British right. It was still foggy and because of this, and perhaps because he was intoxicated, Stephen and his men erred and veered right, encountering Wayne's flank and rear. Confused in the fog and thinking they had found the British line, Stephen's men opened fire. Wayne's men, who were in the midst of an attack, assumed they had been flanked by the enemy. They turned and returned fire. Having been fired upon and hearing the sound of Maxwell's assault on Cliveden in their rear, Wayne's men began to fall back believing they were about to be cut off. With Wayne's men retreating Sullivan became exposed and was forced to withdraw as well. Greene was making good progress until McDougall's men got bogged down in rough ground on the left. This opened Greene's flank to attacks from the Queen's Rangers. In spite of this, the 9th Virginia managed to penetrate all the way to Market Square in the center of Germantown. The British quickly counterattacked them, however, and captured most of the regiment. With the arrival of reinforcements from Philadelphia, led by Major General Lord Charles Cornwallis, the British launched a general counterattack all along the line. Learning that Sullivan had retreated, Greene ordered his men to disengage ending the battle. As with all games in the American Revolutionary War series, the Battle of Germantown has been heavily researched by co-designer Bill Madison, winner of the 2004 Origins Award for Best Historical Miniatures Rules, in partnership with the series designer Mark Miklos. 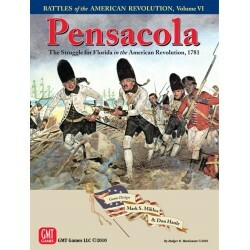 The game map is based upon the 1787 Spencer Bonsall map of the Battle of Germantown to insure accuracy.